A revocable trust is one you can change or dissolve. 1. Can an Irrevocable Trust Be Modified or Terminated? A revocable trust, or living trust, is a legal entity to transfer assets to heirs without the expense and time of probate. It is a flexible estate plan, allowing its creator or grantor to change assets, switch trustees or alter the trust during the grantor's lifetime. A living trust also can be revoked or dissolved if there is a divorce or other major change that can't be accommodated by amending the trust. You need to cancel or revoke a living trust if it is a joint document with a spouse and you get divorced or if the changes you want to make are so extensive they would be confusing. You can make many changes, such as adding or removing securities or real estate, with amendments. However, if you want to change a trustee or completely revise the trust assets and provisions, it might be easier to revoke it and start over. The first step in revoking a trust is to remove all the assets that have been transferred into it. That involves changing titles or other records to put ownership of the securities, real estate or other assets into the name of the trust creator rather than in the name of the trust. 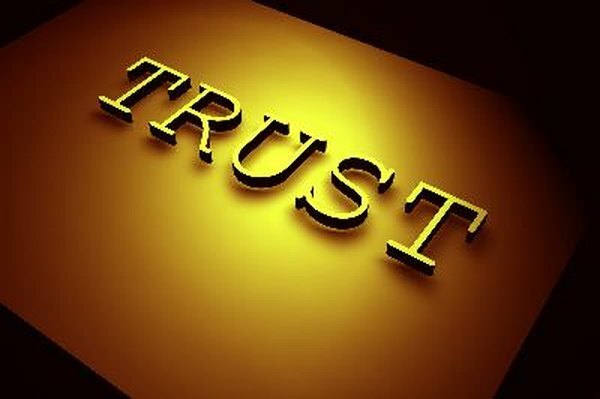 This requires substituting your name for the name of the trust, for example, "I.M. Owner" on a title instead of "I.M. Owner Living Trust, I.M. Owner, trustee." The grantor in a living trust normally also is the trustee, although an outside party can be named. The next step in a revocation or dissolution is to prepare a formal document saying that the trust grantor wishes to dissolve the trust and revoke all its terms and conditions. This should be signed by the trust grantor before a notary public. If the trust was registered with a court, the revocation also should be filed with that court. If the trust was not registered, the revocation should be placed in a permanent file along with the original trust document. In many cases, a revocable trust can simply be "restated." That means creating an entirely new revocable trust document and substituting it for the original. This allows assets already moved into the trust to remain in place but under new terms and conditions. This also can be done to change trustees, if the grantor did not name himself as trustee. Can an Irrevocable Trust Be Sued?